I have this picture on the wall near my desk as a reminder that sheer determination is essential for survival, but intelligence is necessary for success. I wrote a post about this lizard when I first started blogging, but as I still get inspiration from this picture, I thought the message might bear repeating in a new framework of reference. This lizard got in trouble because it was careless. Buffy is too slow to catch most small creatures and normally is content to watch them. This one must have practically climbed over her in order to end up in this predicament. Once caught, however, the lizard did not give up. It didn’t struggle and thrash helplessly, but it was planning something as you can see by the twitching of its tail. That’s why the end of its tail is a blur. It was actually creating a problem for the cat. Buffy wanted to set the lizard down to get a better grip, but the lizard would not let Buffy pin it down with a paw. At the moment of this photo, matters were at an impasse. The cat finally lost its advantage when it attempted to change its grip on the lizard. The lizard escaped. You are probably thinking that freedom was the only thing on the lizard’s mind. Not at all! 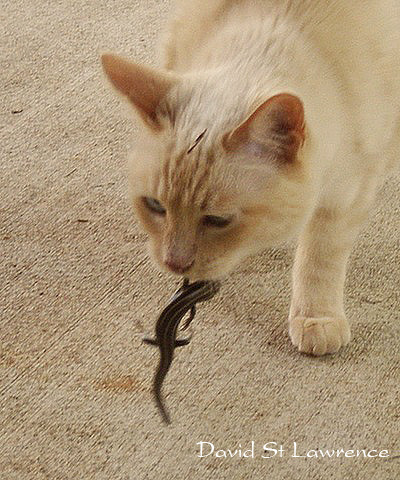 It was actually regretting that it had just failed in its attempt to be the first lizard in history to skin a cat. The lizard had a firm grip on the cat’s tongue and was prepared to turn the cat inside out if it could have gotten a place to set its hind feet. Once again, we see an example of failure of execution due to mis-estimation and poor planning. This is a parable that explains the poor showing of some dot-com companies. They will have an absolutely brilliant concept, ambitious goals, but an unrealistic assessment of resources. Great story! Sometimes the price you pay for an “unfair life” leads you to the reward you seek. This cat reminds me of the MSM who are always perpetuating various lies and myths, like “blogs began as online journals” or “blogs are mostly the province of teens and political fanatics and pajamaed would-be journalists”. The blog, like that lizard, keeps wiggling its tail, not losing its head, and prevents the MSM from consuming it in BS and fabrications. The MSM even tries to start blogs to pretend they “get it, and it’s no big deal”.